Last Sabbath I had a Bible study with a man we’ll call brother S. After Sabbath we had a Bible study that lasted a good 3 hours. After we prayed, which is a prerequisite before any Bible study, he opened his large bag and pulled out his Bible. As he opened it I was amazed to see nearly every page marked as the picture shows. Color coded even with lines going from one part of page to another, showing that he saw them connected in some way. This is not the first time I have seen such markings. A while back I had another study with a brother (we’ll call him brother F) who also had these same markings. So what does this show to us and the Angels? It shows that people are taking seriously their study of the Scriptures. They have more than a surface interest in the Word. Like the Word says they are studying to be approved by God. This really should be a basic fundamental trait that all of us who call ourselves “Christian” should have. This promise is one of the greatest promises we have. It says we are to know all truth. But let’s look at the two mentioned brothers and look at clues to who is being “guided” into truth. To start, brother F and I had a study about a month ago concerning the prophecy of Daniel 2. We watched a DVD of Daniel 2 and while playing we’d stop it and discuss. Keep in mind most Adventists have been taught or have heard that the stone that comes from the mountain is Christ. So as it played brother F began making comments like “I don’t believe that”. When I asked where is the presentation wrong, where is the error? He hemmed and hawed and basically summed it up by saying that the Scriptures showed that Christ is a “stone” and therefore that is the correct interpretation. He was no doubt parroting what we as Adventists have heard about Daniel 2. But in an effort to look deeper into this prophecy, I asked about where the stone came from? And what does the mountain symbolize? He wasn’t so clear. Bottom line, although he basically did not want to accept the study, he couldn’t refute the teachings. As the study of Daniel 2 progressed and started to go into how the church abominations are leavening it, ripe for its purification, brother F began to “pass the buck” as it were. He explained that it is “Christ’s righteousness” that saves us and our works are as filthy rags. I agreed with this but pointed out that we cannot sweep the unholy acts of the church under the rug. I stressed that only sighers and criers of the sins in the church will be sealed and be saved in the SDA church (Testimonies, vol.3 , p.267). To this he kind of just shrugged his shoulders. As if the eternal point really did not awake him nor did he need to address it! 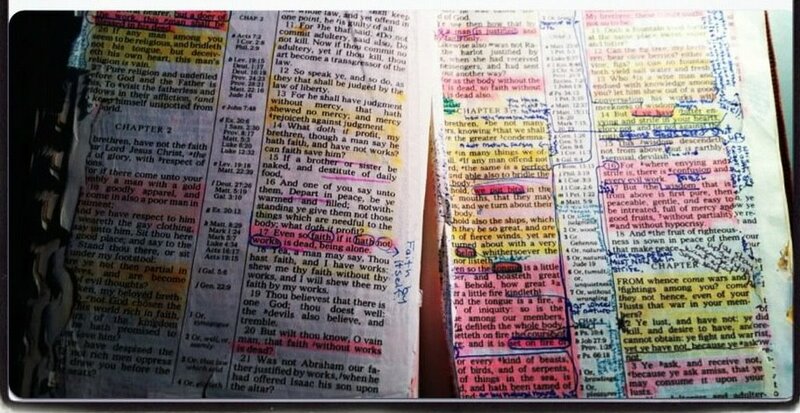 So this brings up the question–why and how can someone so devoted to studying and highlighting the Scriptures ignore clear truth from the very Scriptures they study? How can they not see many truths within its sacred pages? The answer is a long one but we can give some general guidelines. You see many are satisfied in their knowledge. If a new understanding of Scripture comes their way , they rise up a mental block wall to shut it away. They are content in what they think is truth because they do not embrace a new understanding mainly because they feel they might be deceived or off base if they accept it. There is also the “herd mentality”. If the church believes it–so will I. The Jews of old had this same problem! The masses obeyed and believed what their Pharisee leaders taught, their version of truth. Jesus came along and taught truth that was not truth to those who refused to give up their many lessons they had been taught. Nothing has changed much. Truth is still seen by the few as opposed to the masses. No wonder the Scriptures say only 144,000 sealed from “all” the tribes of Israel. SOP tells us we have been taught traditional ideas and lessons that we must “unlearn”. Let us compare with brother S approach to study. First, the reason the study took 3 hours was because he was asking some really good and pondering questions. Unlike brother F, he was searching instead of telling. Our study was about the church purification, backed up by 24 references shown by the Spirit of Prophecy. As we progressed I started to see that his view of purification was in need of realignment. In other words, just like many within our SDA church he saw this purifying process of us as members drawing closer to God and doing more reform in the future. I countered that God has given the SDA church about 171 years to “get it together”. He cannot continue on and on, for it would probably be eons of years if and when we ever have meaningful reforms in our church. The word says that He will take the reins into His own hands (Testimonies to Ministers, p.300). Our study was very satisfying as he made me think and I made him think. But I was heartened because by his questions I could see that his goal was knowing the truth not protecting lessons or ideas he could not rethink. You see brethren our King who knows all, knew that we would , for the most part, reject His final message of Elijah. Therefore He warned us to get rid of our stuck in the mud know it all attitude and accept His new truths He would send via His messengers. If someone comes to me and says, “hey Rob, I found this great new truth from Scripture.” I want to see it and apply the Lord’s remedy to see if it’s really true. I check first if the person who is telling me this 1) believes and keeps our Lord’s holy 10 Commandments (checking his fruits) 2) The “truth” they have discovered is not counter to what the prophets teach (and that includes His last Elijah prophet–who “restores all things”.) If these two important tests are passed then I praise the Lord for truth revealed to my brother or sister. But this concerns Bible nuggets of truth not Bible prophecy. Prophecy is not given to any “man” only to His prophets. How important that we be ready for “fresh truth”? “A new day is dawning on us, Brother, Sister. And now, rather than imagining that we are rich and increased with goods, in need of nothing, we see ourselves in need of everything. Shall we not accept these riches (Truth) that are tried in the fire, and these garments of righteousness by which to cover our nakedness? This entry was posted on December 5, 2015 at 3:28 am and is filed under Present Truth, Proper teachings. You can follow any responses to this entry through the RSS 2.0 feed. You can leave a response, or trackback from your own site. Amen brother, in this work we will encounter many types of believers and many mind sets, but let us keep pressing the truth to the front. Keep up the good work. True brother. Soon our work in this vineyard (SDA church) will be over and then God willing the world’s vineyard.